Once you get the news of the pregnancy you will start making a long list of things that you will need when the baby arrives. This always includes setting up the nursery in the best possible way. You will buy the best pieces of furniture, cozy blankets, and matching bedspreads. Parents do want to make the child as comfortable as possible. Changing the diapers will become an hourly routine after the new-born is home. So, it is always wise to get something like the Costzon Baby Changing Table to remain prepared for the task. You will need to choose one that is sturdy and comfortable at the same time. Large Storage - There are 2 fixed shelves, one for you to store baby's diapers, toys, blankets, etc. one for baby's toiletries, socks and other small items. At the top of the baby diaper changing table, the large changing pad will surely make your baby feel happy and comfortable. 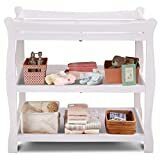 This product is a simple changing table that has the changing section at the top and 2 open shelves are present below it. The product has been designed of oak wood to make it sturdy. A metal bar is present below the changing section to add protection to the baby. The fencing is of a certain height as well to protect the baby. They add a comfortable changing pad that has protective straps for the baby. It is made from polyester foam. The capacity of the top half is up to 30 lbs. The finish of the product is non-toxic. The dimensions of the product are 35.5″Lx18″ Wx37″H. It does require assembly when it reaches you. The product is available in 4 attractive finishes: White, Black, Coffee, and Wine. The best thing about the product has to be the material which is genuine wood. The safety precautions applied to the changing table is really nice. The metal bar is a unique addition. The finish is non-toxic so it wouldn’t cause any harm to the baby. The finish choices are nice as well and done quite well. The open shelves are quite spacious so the parents can keep anything that they like. The changing pad is also quite comfortable. The baby fits nicely on the top without any discomfort. The design is minimalistic and it will look good in the nursery. This changing table is ultra-affordable when compared to similar products from other brands. The instructions are a little tricky to understand. In conclusion, we can say that this changing table will look nice in all nurseries. It is sturdier than many other products as it is made from real wood. Parents will also appreciate the look of it. People who want to buy a cheap but sturdy diaper changing table can definitely go for the Costzon Baby Changing Table. We are sure that they wouldn’t get disappointed after purchasing this product.